Dragon Ball Z: Goku Hishōden (ドラゴンボールZ: 悟空 飛翔伝, Doragon Bōru Zetto: Gokū Hishōden?) is the first handheld Dragon Ball game and the first in the Goku RPG series, released on November 25, 1994 in Japan. 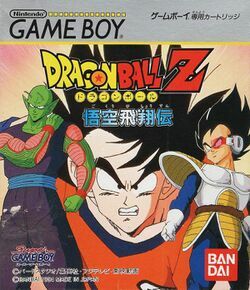 Despite the title, the game starts out during the end of Dragon Ball with Son Goku's fight with Piccolo at the World Martial Arts Tournament and ends with the battle against Vegeta in Dragon Ball Z. Goku Hishōden is also compatible with the Super Game Boy. When connected to the SNES, the screen has color, though to a limit, but has a full-color border. Additionally to the single player and training mode which is the bulk of the game, there is also a multiplayer mode. Only one cartridge is required and only one Game Boy, as the game is taking turns between yourself and enemies anyway. Each character is unlocked as the story in single player mode progresses, and Vegeta is eventually unlocked when the story is finished. There is also a tournament mode. This lets you fight with Goku in the 23rd Tenkaichi Budōkai tournament. Defeat all opponents to be claimed champion. The battle system of the game requires looking at every aspect of the fight. The range of the attack and how far you are from the opponent, how much Ki you have, how many available moves you have to build combos, and how you put your moves together all matter. This page was last edited on 14 May 2010, at 00:59.